I didn’t have to say in line to buy an iPhone, the Apple Store in Aspen Groove served everyone that was waiting in line in about 30 minutes, I just happened to go eat next to the Apple Store with my wife and kids ;-). So I just picked one up on the way to the Restaurant, zero wait. The store is open to midnight but there is not too much activity. I guess only geeks like me (or Sol) will try to pick one the first day, even while being fully aware of the limitations or the price. And this despite that I told everyone that in no way I will get one. Note, we have to test our different web applications on the new platform. ATT seems a little overwhelmed and iTunes provides me with a nice message that it will take a little longer and I will be notified by email when I can activate the phone. Note that I just received a follow-up email that telling me to that the phone will be activated by July 1st noon. Lessons learned: keep it simple, don’t use technology for technology, don’t find a problem to your solution. Well, I got to enthusiastic about trying out new stuff, but now we are back on track. So, 10 days for Flex, 12 hours for Rails+Spry, and 8 hours for plain Rails. Now this comparison is not fair as we spent quite some time on integrating Flex and Rails. But definitively when a Flex application becomes quite large, the compile time causes a drag to the development time. This is compared to plain Rails where you can just keep doing changes at which ever level you want (model, controller, view) and instantly see the change, resulting in a way faster development cycle. Don’t take me wrong I love Flex, but for this project Rails is a better fit. The first RailsWay free-for-all came off quite well. Many of you posted your favorite solutions to the problem of tab-based navigation, as posed by Nate Morse. I take a completely different approach. I ID the body of the page with the name of the current controller. Then I use a descendent CSS selector to highlight the current tab based on the body id and an id given to each link. I don�t bother with replacing the current tab link with a span. If the user wants to click that link again� then it�s the same as refreshing. Totally up to them. What a great approach. Although I would make the choice of the body ID explicit (rather than depending on the controller name), it is otherwise really nice. It shrugs off the whole issue of “should the current tab be a link” by saying it just doesn’t matter—every tab is always a link. Such pragmatism gets right to the heart of the Rails Way: implement just what matters, and nothing more. A number of solutions relied on tightly coupling the controller and tabs. While this may seem like a time-saver at first, I believe that it’s unlikely to remain useful as your application grows. You’ll find yourself moving functionality into strange locations in order to make your tabs highlight correctly. The problem is amplified with a restful application where your choice of controllers are dictated by the resources that you’re managing. You may have a list of comments in several different sections of your application, but not want to highlight the ‘comment’ tab whenever you display them. Personally, I prefer the really simple approach of a before filter and a navigation partial. Thanks, everyone for your submissions! The best way to contribute to the Rails project is to submit a patch. This episode shows how to do exactly that. There’s also a surprise at the end that you don’t want to miss! When you program for a living, you write lots of code. There is often some code that you are fond of. We started the Code Digest series to present such code written by the RHG developers. We encourage other teams and individual developers to share similar snippets in their blogs so we all can learn from each other and become better rails developers. Continue reading "Code Digest #2"
page.replace_html message_html_id ,"Username is not available, please choose another." page << "document.getElementById('" + message_html_id + "').className = 'failed'"
The option values are the name fields of each hash. The key is, we want the current option value to be the first one in the option list, and the rest to be in alpha order by name. So let’s create an option builder from the bottom up. That gives us a list of channel names. Using the list above, it would be [“Fitness”, “Diabetes”, “Pregnancy”]. Now our options list looks like [“Diabetes”, “Fitness”, “Pregnancy”]. "<option>" + channelname + "</option>"
to get the same result, and eliminate the unnecessary options binding. Here is an extension trying to execute a block multiple times before giving up. Handy for network operations and such. When you are writing a script that needs to auto install gems, you are likely to run into a problem that it stops because there are multiple platform versions available (jruby, win32, etc) and the gem command expects you to pick one that matches your platform. This patch forces to use a specific platform so no user interaction is needed. Original idea from Warren updated to support rubygems 0.9.4. Since class-level instance variable are not inherited by subclasses, you need to go some extra steps when writing a plugin using them. Depending on the amount of such variables, I have been either defining a method instead of class-level instance variables or forwarding them to subclasses. Example #1. acts_as_readonlyable needs to provide a single class level instance variable. Defining a method instead. Example #2. acts_as_secure uses a bunch of variables. Forwarding them to subclasses. This gem provides a metrics collecting for controllers, database queries, and specific blocks of code or methods. It is designed to be light-weight and have minimal impact on production builds while providing performance indicators of the running application. This software is released to be used at your own risk. For feedback please drop us a line at rails-trunk [ at ] revolution DOT com. Using this plugin should not be your first step in application optimization/scaling or even the second one. Continue reading "[PLUGIN RELEASE] Metrics"
[ERROR] [2007-06-21 23:19:56] [trunk] [Metrics]||[Request to [Test::SomeControllerWithMetricsId]]|0.001373|action = index|path =some? Configuration can be updated in metrics/config/metrics.yml, you may copy this file to your RAILS_ROOT/config/metrics.yml and customize for your application, the RAILS_ROOT will be checked first. metrics is released under the MIT license. The Rails console is one of my favorite tools. This episode is packed with tips and tricks on how to get the most out of the console. 42! No way, that’s twice the legal drinking ages in most of the US states, 2.625 times the Swiss legal drinking age. I have been a professional programmer half my life and I am still having fun. I am now the oldest coder on most of the projects I work on 🙂 Ruby and Ruby on Rails is inspiring me in trying to write elegant and better code. But it’s really working on awesome projects and working with awesome people that inspires me to continue developing software. This said I will be away from my computer today. I will go to the Zoo with the kids and then to the pool. Couldn’t be much better. Have fun! Open For Business: eBay Desktop Beta – an Adobe AIR Application. The invitations are going out! So, if you haven’t yet, go signup for the eBay Desktop beta (code name Project “San Dimas”“) at ”http://www.projectsandimas.com/">http://www.projectsandimas.com/. 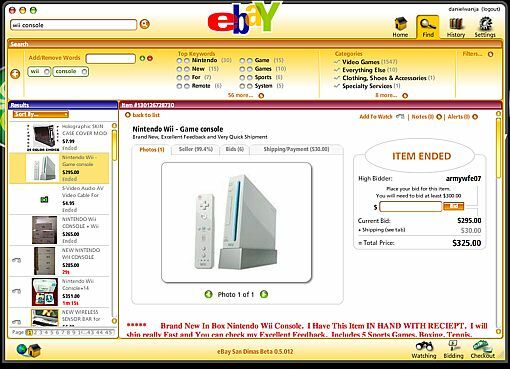 Now if you know Sean you will understand why using the eBay Desktop is fun. When Sean is not coding he is playing games, and he want’s any application to be fun and playful. Even when he gives talks he manages to demonstrates how to program a WII controller. It’s cool that Alan Lewis gave them the creative freedom to create some new user experience concepts on top of the existing eBay apis. PS: Hey Sean what’s your blog…or are you too busy coding? Part II of a discussion with and about women in development.